Younger son of John Blackett (1683-1750) and Patience, daughter of Henry Wise. Grandson of Sir Edward Blackett, 2nd Baronet. He was born in Newcastle on 1 January 1728 or 1729 (sources vary as to the year) and according to the noted autobiographer Rev. Dr. Alexander Carlyle was named after Erasmus Lewis, a close friend of Blackett’s father and secretary to Lord Oxford. After serving an apprenticeship in Liverpool under Foster Cunliffe, who prospered from the infamous triangular Atlantic slave trade, Blackett became a partner in a Newcastle coal dealership with Alderman John Simpson. J.E. 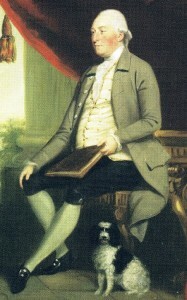 Blackett was appointed Chief Steward of the Blackett lead company by his second cousin Sir Walter Calverley Blackett in 1773 and continued in this position after the ownership of the company passed to Sir Thomas Wentworth Blackett and subsequently to the Beaumonts. He retired in 1804 after managing the company’s business for 31 years. Blackett was also one of the original partners of the Newcastle upon Tyne Fire Office, now subsumed into Aviva plc. He was prominent in Newcastle public life becoming an alderman and serving as Mayor on four occasions (in 1765, 1772, 1780 and 1790). In 1761 Blackett married Sarah Roddam. Their daughter Sarah married Cuthbert Collingwood, an officer in the Royal Navy, in 1791. Later as Vice Admiral Collingwood Sarah’s husband was to become second-in-command to Lord Nelson at the Battle of Trafalgar (1805). John Erasmus Blackett died on 11 June 1814 and is buried in St. Nicholas’s Church. Some ten years or so after his death Blackett Street in the centre of Newcastle was named after him as part of the development of Grainger Town.